Students played at the Wild Rose Montessori school in Cambridge, one of seven Wildflower schools in the city. When Sep Kamvar, a computer scientist and former Google executive, began looking for a preschool for his 2-year-old son, no existing options felt right. Multiple schools had components he liked, but none brought it all together. 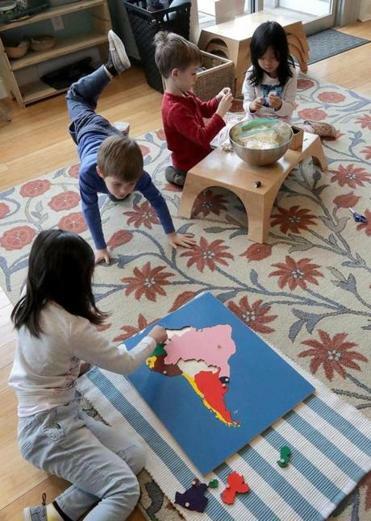 In his search, Kamvar’s attention was continually drawn to the Montessori method, in which learning is tailored to each child’s interests. He visited Montessori schools in the Boston area, read a dozen books on the teaching philosophy, and ultimately decided to create his own school that would adapt the 100-year-old teaching method to the 21st century. A friend told Kamvar, currently on leave from the MIT Media Lab, about available storefront space on a busy street in Cambridge. “I thought if I don’t rent a space, I’m never going to start a school,” said Kamvar, who studied chemistry at Princeton University and got a PhD in computational mathematics from Stanford University. While at Stanford, he cofounded a personalized search engine called Kaltix, which was bought by Google in 2003. The school he created in 2014 is a 600-square-foot classroom with traditional Montessori wooden materials, plants, and kid-size furniture, a place Kamvar called Wildflower. But the school is also the seed of a big new vision: a series of microschools, embedded in city neighborhoods, that function as experimental spaces for data-gathering technology on children’s behaviors to better understand their needs, and test out new materials for teaching modern-day concepts, like coding and design. Referred to as nodes in a network, the schools are unified by nine principles, such as an artist-in-residence in each school and an emphasis on parent education. Kari Frentzel (right) worked with a student at Wild Rose. “The technology supports Maria Montessori’s scientific method,” said Matt Kramer, chief executive of the Minneapolis-based Wildflower Foundation and former co-chief executive of Teach for America. Founded last summer, the foundation provides support to existing schools and lays the groundwork for new ones. It has plans to raise $14 million in the next two years and already has $5 million toward that goal. Among Wildflower’s funders are the Robert Wood Johnson Foundation, the Walton Family Foundation, the Chan Zuckerberg Initiative, and several tech entrepreneurs who were themselves educated in Montessori schools, Kramer said. In just under three years, Wildflower has grown into nine schools in the Boston area, including seven in Cambridge and one each in Arlington and Haverhill. There are also two in San Juan, and schools are planned in Denver and Minneapolis. A key goal is to create what Wildflower calls “ecosystems,” clusters of multiple schools in a single area so that resources and expertise can be shared. “We want the schools to be mutually supportive and mutually accountable,” Kramer said. Castle O’Neill, cohead of Wildflower’s first elementary school, Wild Rose, in Cambridge, came from a school with 450 kids. “The size was overwhelming,” O’Neill said. In her new role, she values how quickly she can meet the needs of students. For instance, her current class has three children from Singapore and they’ve been discussing switching from Spanish to Mandarin as their second language in the classroom. “In a big school, that would involve a three-month study and a task force, whereas here we can just make that decision,” O’Neill said. Wildflower joins a wave of microschools sprouting around the country, such as AltSchool in San Francisco and Acton Academy in Austin, Texas. Michael Horn, cofounder of the Clayton Christensen Institute that studies “disruptive innovation,” said these mixed-age, one-room schools are in response to parents’ growing dissatisfaction with public schools and increased interest in homeschooling. Micro schools combine an intimate, homey environment with structured learning. Tuition ranges from $15,225 to $22,000 a year, depending on the school and hours. The schools in San Juan are public, and a few elsewhere already accept state-funded education vouchers. Kramer says the foundation is also working with districts and applying for charters to make Wildflower accessible to low-income families. When Nancy Turnquist, Lindsey Collins, and Meghan Shaw, three mothers from the Cambridge area, heard they could apply for a startup loan from Wildflower to open their own school within the network, they couldn’t pass up the opportunity. They all wanted a school that was shaped more directly by parents but didn’t require them to be in the classroom. So they came up with Dandelion, a co-op in Cambridge, run by two Montessori teachers who work closely with parents. Collins, an instructional technologist at Northeastern University, built Dandelion’s website and completed the necessary paperwork. Shaw spearheaded logistics and marketing. Turnquist, more of a community builder, wound up recruiting most of the families the first year. Her husband, an architect, converted a bike shop into a Montessori-style classroom. “We need entrepreneurial parents to bring their skills and perspectives,” Collins said.